As of the end of 2010, more people get their news from the Internet than from newspapers — and more ad dollars went to online outlets than to newspapers, too. In surveys conducted by the Pew Project for Excellence in Journalism, 34% of respondents said they read news online within the past 24 hours (as opposed to 31% who favored newspapers); and a full 41% said they get most of their news online, 10% more than those who said they got most of their news from a newspaper. Of course, the 18-to-29-year-old group overwhelmingly cast their vote with the web; 65% said the Internet was their main news source. Poynter’s annual State of the Media report showed that the web was the second most popular source of news; local television news is still the number one source for the majority of people. Local TV also led in revenues, with digital media coming in second. Also, online news media was the only medium that saw growth year-over-year; from radio to television to newspapers and magazines, every other medium saw a decline in audience. 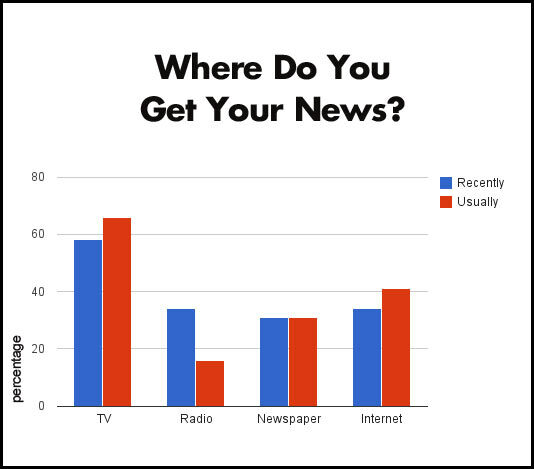 In general, it can be said that text-based news audiences are dwindling. Only 40% of people in the study said they read the news in an online or print newspaper, a 12% drop from five years ago. Last year marks the first time online advertising outpaced newspaper advertising. The sector grew 13.9% between 2009 and 2010 to reach a $25.8 billion total. Not all of that ad spend went to online news publications; in fact, search advertising continues to dominate the online ad spend landscape. We’ve been watching the web’s impact on journalism for quite some time — both how the Internet is affecting newsrooms and newspapers and how it’s changing the way viewers and readers get news. With many outlets beefing up their online and mobile strategies even as print sales decline, the figures from Poynter’s research are nostalgia-inducing and predictable at the same time. After all, once The New York Times admits print’s days are numbered, it’s pretty much a long, slow and painful downward spiral to the point that the newspaper, like the vinyl record, is a relic for collectors and anachronists. For now, though, we continue to look forward. The Pew Project’s research showed that almost half of Americans in a survey said they got at least some of their news on a mobile device or tablet. And as tablet makers, app makers and news outlets continue to perfect the news consumption experience on that form factor, we’ll have a whole new breed to analyze and fret over this time next year. So what do you think of that? It was bound to happen right? Chime in below and click the like button if you found this interesting.